I’m the happy husband of Cindy and father of Axel. I have a bachelor’s degree in marketing with a specialisation in management and speak four languages fluently. 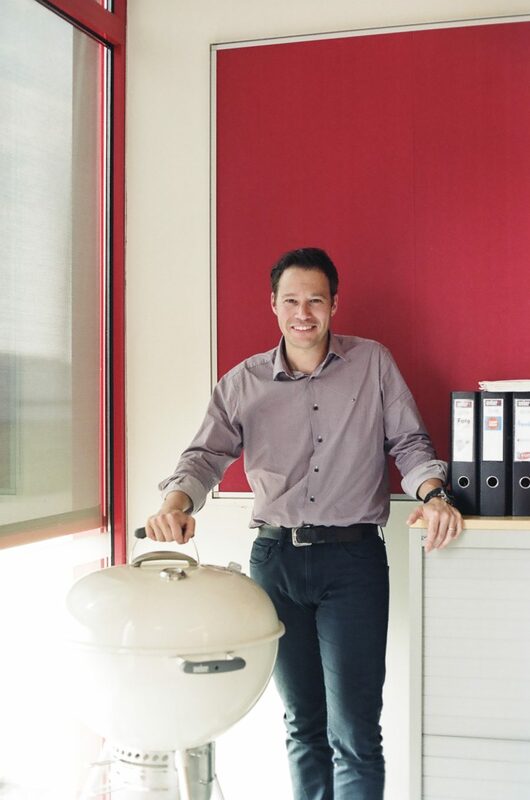 I’ve been working for Weber-Stephen Products, the world’s leading barbecue manufacturer, for more than eight years as a key account and B2B manager. My parents’ education played a key role in my life: they taught me the value of money and the importance of respecting one other, listening to people, accepting differences and adapting myself to different situations. These teachings made me stronger, more self-confident and respectful; they shaped the way I live and work today. As a key account manager, I’m the main bridge between the company and its customers. It means that I have to keep a positive attitude at work, listen to my colleagues, share ideas and take every customer feedback into consideration. I’m a reliable person who’s very thorough in my work. My lovely home made up of my wife and my son, and waking up every day to take up new challenges at work. There are many different cultures in Belgium, so there’ plenty that we can learn from each other. We speak several languages, which gives us the opportunity to travel a lot without complex. On top of that, Belgians are respectful and welcoming people. Benoît Poelvoorde, because he lives his life without complicating anything. He’s very friendly to everybody, and stays true to himself despite all of his success and notoriety. Jacques Brel, because his greatest hits are timeless. Not only did he sell over 25 million records worldwide, he was also a successful actor. Nobody could expect such a career; he inspired renowned songwriters like David Bowie, Ray Charles and Frank Sinatra. Georges Prosper Remi, better known as Hergé, because he’s Belgium’s greatest cartoonist for creating Tintin. It has inspired a wide range of adaptations for TV, cinema and computer gaming, and there’s even a Hergé Museum in Louvain-la-Neuve which people from all over the world visit. To Atomium Restaurant, for its typical Belgian cuisine and perfect location, perched high above the ground in the top sphere of Brussels’ most impressive monument. I’d take them to the Maredsous Abbey, a Benedictine monastery located in the peaceful Molignée’s Valley in the middle of nowhere. This abbey is also known for producing of Maredsous beers and cheese, which is inherently part of our culture. To end the day, we would relax while enjoying an ice-cream and pedalling an hour or two along the old railway across the picturesque valley. I studied marketing with Sylvain the Ketje about 15 years ago and we continued to stay in touch. Three years ago, we met up again for lunch and he told me about his great project. I was really excited to try out all the BK sauces and so proud of his entrepreneurship. I first tasted the Ketjep in a classic Weber burger at home. Why do Belgians remove their glasses during an alcohol test? Because it’s two glasses less. Because we’re openminded and very attentive of other countries. We achieve big things with few resources.